Earlier topic: Custom die-cutting suggestions? I just went down into the shop to dig out a piece I printed 25 years ago. The piece is an earlier quote from William Everson and was titled The Final Joy of Printing. “When type is cleanly inked with solid ink, dense and well-seasoned, and laid on ever-so-lightly with a true roller, the ink carefully built up through stroke after stroke, placed always on the very face of the type, never squashed down upon the counters; when this finely-inked type is pressed into the paper and held there in what is called the “dwell” of the handpress, to lie at the very bottom of the impression, then when the sheet is removed all about it the light refracts from the crimp the letter made in its strike, and glows there, and the whole page becomes radiant with a suffused, a subdued and upcast light. This passage still can give me a tingle. Amen Brother Antoninus (William Everson) and thanks for reminding me of it Barbara. Oh course it matters! Fidelity and image repoduction (resolution) via transfer of viscous liquids (ink) is all about rate and pressure! You can make most inks work the way you need them to if you have the right amount of pressure and the right amount of dwell (presuming your substrate is good). It’s amazing what “the extra minute” will bring you! I’ve got to agree that dwell does indeed help. Those of us who use manually operated presses tend to dwell naturally. The other thing that helps a lot is dampening the paper. With dampened paper, you can get nice, stong impressions using far less pressure. It works like a charm….. but for whatever reason it’s not used a lot by hte newer crop of printers. I wonder if it’s because they just don’t know about it. I think it’s also because a lot of the newer crop of printers may be dealing with studio situations that don’t allow for a lot of sheets to spread out re: drying. Here we actually print a bit of intaglio, so we have a sheetrock drying system that helps to aid in paper drying/flatness. It’s actually pretty minimal with regard to the footprint it takes up, as well, and was largely procured as scrap drywall offcuts. Thanks, Rick, for the Everson quotation — it gave me a tingle, too. HavenPress, this is why I concentrated on dwell for this piece, since increasing the pressure and certainly the amount of ink were not workable options. I was working with a text-weight paper, printed both sides, so I was going for a pretty much kiss impression. Adding ink would risk compromising the fine details, which are hardly more than scratched into the metal. Loosening the ink might have the same effect. The paper was dampened, Dave. Honestly, I wouldn’t print any other way if it suits the paper. I used to think it was a hassle, but like anything else, once you’ve done it enough it becomes routine. I actually enjoy the process now; it helps you focus on the fusion of animate (paper) and inanimate (typemetal) that is at the heart of printing. Since, on a flatbed cylinder press, the paper comes in contact with the form only a thin line at a time, it takes some practice to develop a rhythm that produces consistent results. I suppose that on a platen press, you just slow down, right? And of course it helps to separate the larger solids from the fine-lined portions of the piece, making multiple passes. Yes, on a platen you can slow the whole process in order to dwell; but also, if your setup is good you can print twice without unloading the sheet on many handfed platens; as long as the paper doesn’t shift, this trick can really add quite a bit of coverage with minimal spread. Another thing you can do on Vandercooks (or other proofing presses) is run the sheet twice without ungripping it. This procedure takes a long time and it’s a bit materials/labor intensive, but I’ve done it w/my number 4 with great success. With the press on impression, you can put some masking tape at the tail of your sheet and then put it in the grippers against the guides. Your sheet needs to be long enough that you can have a bit of an extra tail to cut or tear off; Run the print through, being very careful to hold it up against the cylinder with your hand on the top of the impression cylinder so that it stays very flat. When the sheet comes off the cut/block, DO NOT LET GO. Burnish the masking tape down and make sure you have the entire sheet stretched out. Back the press up, and print a second time. This method works with really long forms especially (when the paper is very likely to fishtail and mis-register at the tail of the sheet). Actually, dwell does not seem to matter. For well over 500 years it was not a concern. More of a concern was printing as fast as possible; not holding that devil’s tail with eyes rolled upward like a saint as they do in the printing museums. Not exactly sure where this notion started. There is no magic in that hesitation, the magic is with the pressperson. A Vandercook does have that single line of impression. Vandercooks are actually set up to run fairly slow, fast running the cylinder down the bed is just going to result in errant presswork. But trying to hold a dwell across a form can actually itself cause problems. The movement has to be sure without hesitation. Halting the movement to create dwell may cause the rollers to lay down ink erratically. Cylinder presses just don’t function like an iron-hand press where dwell is inherent. But realistically, does ink really penetrate the paper more if the pressure is held for a bit longer? Really? Well, we do like our myths. Yes, by far, dampening paper greatly increases the perfection of the printed page. Now that is test proven. How can you produce an effective “dwell” on a Vandercook? Or with any other hand powered cylinder press? among the potential problems I can imagine might be a healthy case of rotator cuff tear. It seems to me that a good, proper makeready (neath the form or the packing) would be the solution on a cylinder instrument (even a hand powered one). Might it be that your paper is over-dampened? Yes Gerald, the ink coverage (on solid areas) is much better on a handpress if there is a slight dwell when the platen has reached full impression. Perhaps it is because it allows a little more time for the ink in interact and bond with the paper before it is pulled away? This has been observed from personal experience and observation time and time again. We are not talking “a minute” as stated somewhere above, but somewhere around a second or less. No mythology, simply a fact. Yes, capillary action is a “thing”. It exists. And it is affected by rates. Amounts of time and rates of contact. It is physically verifiable…..
Running slower but at a steady rate produces more transfer of the liquid in question; in this case ink. Running faster vice versa. I mean, the whole principle of processing a lithography stone with stiff senefelders black and a litho roller is BASED on this principle. It works. Same with printing flatbed litho. Same with printing flatbed letterpress. There are points at either end of the viscosity bell curve where it is difficult to observe or record the gain, I grant you, but it can be observed. Thanks, everyone, for the thoughtful and expert comments. If you look at the image on my Flickr page at the “original” size (see link in the initial post), you’ll see a definite difference in the dwell versus non-dwell prints. Look particularly at the figure’s eyes, as Enrique has pointed out. The difference carries through when looking at the print at normal viewing distances. Dan, I doubt that the paper was too damp since it felt dry except for a bit more coolness to the cheek than the undampened paper. vandy1905, I hear you. I never stop the impression cylinder. I just slow the rate of travel so that it goes across the form in such a way that the paper comes in contact with the form for about 1 1/2 seconds, at most, at each point. As Rick points out, that’s all it takes to make a difference. I’d agree on all points. Printing on a Vandercook, year after year, will just naturally lead to rotator cuff problems; one doesn’t need to hugger-mugger the cylinder all day long attempting to create dwell to come to that unhappy ending. I’ve got the medical bills to prove it. To say nothing of the damage it will do to a back. I couldn’t run one now even if I wanted to. I never had any problem printing with a Vandercook. I did have problems with papers that were poorly made, or not manufactured for letterpress. I’m not exactly unaware of the iron hand press and dwell. Christ, I have printed collotype images on an Albion. But I also am quite well read on Everson who I greatly admire. But you do realize he was a mystic, not a scientist. And I am quite adept at obtaining full coverage on solids, thank you. Dwell is the period between pulling and releasing (on a hand press). To make more out of that is like, where are you getting this? Just a note. I don’t hide anonymously behind an avatar. I can be checked out. Who are you? Gerald, I think you have heard of google? Google my Avatar. I’m not really exactly hiding under a rock, man. “Dwell” can be used to refer to a few things, but in this case, the O.P. Barbhauser seems to have meant the amount of time spent in contact with the inked form. In this case, she is decreasing the rate/speed of travel as she cranks her cylinder across her Vandercook, which is maximizing this time spent with her sheet in contact with the inked form. With decently loose ink, this isn’t as much of a helpful item as one would likely not observe a difference; but with decently firm, tacky ink, it actually does make a rather large difference. If you don’t think ‘dwell’ or ‘extended time in contact’ or hell, Gerald, why don’t YOU name the thing we’re all discussing that you’re digressing from- but if anyone does not believe that this promotes transfer, you’re welcome to have that opinion but there is a way to ‘proof’ this, whether by observing rubber rollers or observing impression. Ink vehicle is POLYMER. It is made of long oily polymers most of the time- rubber based polymers are a little shorter than linseed oil/vegetable oil based inks, but nontheless polymer. Polymers that are long like to stretch as if taffy; but they break when stretched too quickly. So, when you drag an ink knife through a pile of ink slowly, it moves. Or, if you touch an ink knife to a pile and slap at it, the ink knife doesn’t really come away with much ink. Conversely, if you push the inkknife down with the same pressure but hold it there, it will come away with more ink. The same principle has been applied to stone lithography since leather rollers and senefelders black were used to roll up lithography stones during the processing phase- a very stiff black that ‘lifts’ if the roller is applied at speed, known as snapping; but it lets go if the roller is applied at a very slow speed, ‘putting ink down’. Well, it aint ‘dwell’ insomuch as it’s an iron handpress, but it sure is on topic if we’re talking ink/cylinders/physics!!! But why don’t you get a rubber brayer and a piece of glass. Ink up an even little stripe of thinned/reduced tack ink, and then an even little stripe of the original ink. Put a piece of bond paper down over each and push on one with your finger, count to ten; then, push down in another spot but for a second. You’ll see a difference in the amount of ink transferred. It’s just like, physics, man. Anyway, Gerald, I’d really love to meet you someday! You have a lot to offer and I chapeau to you often, but when I disagree- well, I disagree. Come out to New York and say hello and I’m happy to buy you a pint of your favorite beer. Nice to meet you. Had a hell of a time finding you on Google though. Most references are either dead or won’t open. One just showed a lot of photos but obliterated text. Found an article though which I assume is you. I’ll take that beer in friendship. I really don’t give a crap about this dwell stuff but if it’s physics, point me to a scientific reference. Then, I’ll believe. I understand what you are saying about ink, been in the biz for over three decades (unfortunately), but still don’t see how this relates to dwell. Dwell is an instantaneous function of the machine, whether it be a hand press, a job platen, or a cylinder press. I can say that I have never seen a legitimate technical study that gives it any more credence than that. Though I would like to see one. We are just talking here, right? Same as we might in a bar. Not trying to win any points for winning, and am not in anyway concerned about losing, though I do like to find good info in doing so. Opinion 2: that dwell MIGHT make a difference but it appears that there hasn’t been sufficient technical study of the matter for it to be “accepted practice”. Both seem to be valid points to me. I think dwell does indeed have an effect on image quality, BUT I don’t have any sort of technical back-up as to why it helps, or even if it has a measurable effect. So I think this one boils down to one’s philosophical outlook on printing. I happen to be VERY empirical in my approach….. if it seems to work, then I’ll use the techique even if it’s not “accepted practice”. Others of a more technical bent tend to prefer the methodologies that have some scientific / documented back-up. Either way, in the friendly atmosphere of us enjoying a beer and debating printing philosophy…. I’ll buy the next round! This post has me sort of cringeing …. Whilst i was learning on the shop floor the old boy was always bantering with the other old uns about the hand fed presses and early treadles ,the interest for them i learned was the machines that were not snappy presses. A snappy press i was told was one which had no DWELL at the feed , one with good reports was a press having a platen that tipped up almost flat and sat there for a moment before tipping off to impression , this dwell made the press easier to operate and considerably safer than a snapper . I have one that snaps its a John Haddon Swift . That, and I’ve been told on many occasions (and read places I cannot recall) that people prize Chandler and price Platen Presses for their LONG DWELL ON IMPRESSION among other great atributes. I’ll try and dig up the advert I read that in. I have it somewhere…. Not much of a web presence. I’ve been collecting type and presses since the mid 70’s and operate for my own education and entertainment. I have flown under the radar for decades because I simply do not have the time to be doing jobs for others, although I get sucked into it all the time (doing broadsheets for local events mostly).Reading and learing about letterpress and typography all the while. I have a little over 2,000 fonts of classic and antique handset type in the shop. I print practically everything on a Poco proof press simply because I enjoy hand inking and hand pulling each impression. I started out as a fool with a proof press and have been The Foolproof Press since April 1, 1976. Almost all of my type and presses reside in the basement of my huge century-old farmhouse in rural Iowa. In the real world I was a print production manager in California until moving to Iowa to do the same thing for Meredith Corporation (Better Homes & Gardens et al.) until taking early retirement about seven years ago. I now pretty much have a full time job teaching people with mental dissabilities how to farm (sow/grow/harvest vegetables and raise chickens - both for meat as well as year-round egg production). Between that, maintianing my own acreage and gardens, maintaining/improving the grand old house, doting on grandchildren, I still manage to try to squeeze in a little time down in the shop - but that still isn’t easy. I am a member of the Amalgamated Printers’ Association and also serve as a volunteer director for Printers’ Hall - a 3,000 sq. ft. working letterpress museum in Mt. Pleasant, IA. My plate is full. My strong suite is type. I taught myself how to print and merely offer observations from my own experience. and we are very happy that you do and make your contributions. Thank you. Thanks for the response. Nice personal history. Sure wish folks around here would actually reveal who they are when they make statements. Sure would help clarify things. Philip Gallo is a great typographer, fine printer, and poet and used a Poco with his own registration device. The work was always perfect. The illustration by Gaylord Schanilec is a tribute. Philip has a blog, that is well worth looking at. He is at the higher end of things. It hasn’t been updated for a couple of years though. Thanks you so much for the Philip Gallo info. I was totally unaware of him. I do know Gaylord and he is an amazingly talented individual. I worked out my own registration system for my Poco decades ago. It basically involves prepunching oversized stock and having reistration pins taped onto the cylinder. Placing the punched paper on the pins serves as a gripper as well as registration system. There is a little bit of slipage between the teeth on the cylinder and the bed so it is critical that each multi-color print goes through the press in the same direction each time (I print going back and forth in both directions). 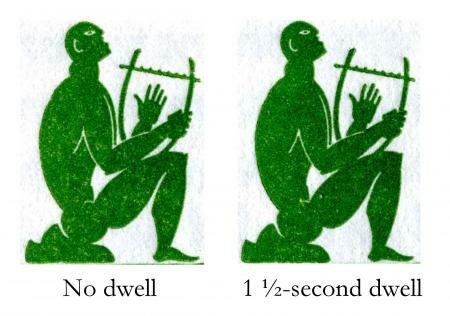 Reading through what I could with the time I have, I have to say that I always thought “dwell” was, as Peter mentions, the length of time in which the platen was open. I guess one has to qualify just what sort of ‘dwell’ they mean. I will soon be receiving a Kluge Open press, cammed by Brandtje Kluge for, what they call a longer dwell. The platen stays open longer. I do hand feed automatic Kluges, and they do take some getting used, with their much increased cadence. However I think the actual impression time with the Open is the same as the automatics. In my hand-press days about two decades ago, I used handpresses for my cuts, and did linger the impression. Not knowing there was a specific term for it, I just called it a ‘longer impression’, a hold over from my photographic background where in the darkroom we had longer or shorter exposures with the enlarger. Eventually at Heirloom Press, we spoke about ‘long’ and ‘short’ impressions. Ah, but that was just shop-talk.